WEST LAFAYETTE, Ind. - New research findings contradict a fundamental assumption about the functioning of "organic" solar cells made of low-cost plastics, suggesting a new strategy for creating inexpensive solar technology. Commercialization of organic solar cells has been hindered by inefficiencies, but the findings point toward a potential path to create a new class of solar technology able to compete with standard silicon cells. "These solar cells could provide a huge cost advantage over silicon," said Muhammad Ashraful Alam, Purdue University's Jai N. Gupta Professor of Electrical and Computer Engineering. Plastic solar cells might be manufactured using a roll-to-roll process similar to newspaper printing. "This has been the hope for the last 20-25 years," said Bryan Boudouris, an assistant professor of chemical engineering. Because organic solar cells are flexible they could find new applications that are unsuitable for rigid silicon cells such as photovoltaics integrated into buildings, and they have the potential to be lower-cost and less energy-intensive to manufacture than silicon devices. However, a critical bottleneck has prevented development of organic solar cells efficient enough to compete with silicon solar technology. "Now it appears there is no fundamental reason why organic cells have to be less efficient than silicon," Alam said. Findings are detailed in a research paper appearing this week (Aug. 17) in Proceedings of the National Academy of Sciences. The work was spearheaded by former doctoral student Biswajit Ray, who has graduated. "Biswajit had the courage, conviction, and persistence to do a series of difficult experiments, and he was ably supported at various stages by doctoral students Aditya Baradwaj and Ryyan Khan," Alam said. The paper was authored by Ray, Baradwaj, Khan, Boudouris and Alam. The primary bottleneck to more efficient organic solar cells is rooted in the fundamental workings of the organic photovoltaic technology. As the semiconducting material is illuminated with light, electrons move from one energy level to another. Due to the atomic structure, the electrons in the semiconductor occupy a region of energy called the "valence band" while the material is in the dark. But shining light on the material causes the electrons to absorb energy, elevating them into a region of higher energy called the "conduction band." As the electrons move to the conduction band they leave behind "holes" in the valance band, generating so-called electron-hole pairs in the plastic solar cells called excitons. "Because the electron is negatively charged and the hole is positively charged, they like each other so much that they orbit around each other," Ray said. "You have to keep these two separated or they will recombine and you will not generate current." This "charge separation" is maintained by inserting numerous structures called bulk heterojunctions, a design that has been a challenge to manufacture in a high-speed, large-scale and reproducible manner. "You can think of these heterojunctions almost like knives cutting through the material to separate the electrons and holes," Alam said. "These heterojunctions have to be distributed throughout so that no matter where the electron-hole pair is generated you can cut them." This requirement limits the efficiency of organic solar cells, a bottleneck established by research more than two decades ago. However, Ray showed through detailed computational modeling that a fundamental assumption about the organic solar cells was incorrect, eliminating the need for heterojunctions. "He kept saying he didn't need to invoke excitons in order to explain many of the experimental results," Alam said. "It turns out that the original experiment was misinterpreted." This misinterpretation arises from the design of organic cells. The cells have two metal contacts, one on top and one on the bottom of the device, and each is made of different types of metal. Because of this configuration, incoming sunlight generates an electric field concentrated at the bottom of the cell, which allows the electron-hole pairs to readily recombine. Ray proposed flipping the contacts so that the electric field forms at the top of the cell instead of at the bottom, allowing for better charge separation. "He inverted the structure and explained that the inefficiency is taking place because the electron-hole pairs are not staying separated," Alam said. Simulations showed flipping the configuration allowed for better charge separation and higher efficiency, and then laboratory experiments by Ray, Baradwaj and Khan validated the new concept. The findings also suggest the design of organic solar cells can be simplified, representing a major potential innovation, Ray said. Whereas conventional organic solar cells are made by mixing two types of polymers, the new design requires only one polymer. "Currently, you have to design the solar cells according to how well two organic materials mix together in order to produce these numerous heterojunctions," Boudouris said. "But if you only needed one polymer instead of two, the manufacturability on the large scale could be very much improved, so this is an exciting development." 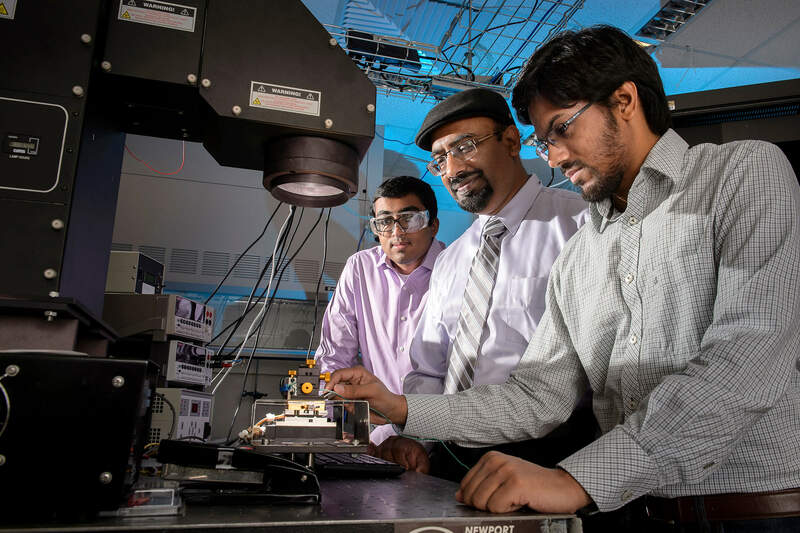 Findings also suggest that producing the cells out of purer polymers could result in more efficient solar cells, and the research likely will lead to a better understanding of the physics of how organic solar cells operate, Alam said. Much of the experimental work was performed in the Purdue Solar Energy Utilization Laboratory, formed with funds from the National Science Foundation, which allows specialists from different fields to collaborate. The research is ongoing, and Khan will continue to work on a new class of solar cells that do not require bulk heterojunctions. The research was funded by the U.S. Department of Energy through DOE’s Center for Re-Defining Photovoltaic Efficiency through Molecule Scale Control, the National Science Foundation’s Network for Computational Nanotechnology, and the U.S. Air Force Office of Scientific Research. The bulk heterojunction organic photovoltaic (OPV) architecture has dominated the literature due to its ability to be implemented in devices with relatively high efficiency values. However, a simpler device architecture based on a single organic semiconductor (SS-OPV) offers several advantages: it obviates the need to control the highly system-dependent nanoscale BHJ morphology, and therefore, would allow the use of broader range of organic semiconductors. Unfortunately, the photocurrent in standard SS-OPV devices is typically very low, which generally is attributed to inefficient charge separation of the photogenerated excitons. Here we show that the short-circuit current density from SS- OPV devices can be enhanced significantly (~100-fold) through the use of inverted device configurations, relative to a standard OPV device architecture. This result suggests that charge generation may not be the performance bottleneck in OPV device operation. Instead, we find that poor charge collection, caused by a defect-induced electric field screening, can be explained as the primary performance bottleneck in regular-geometry SS-OPV cells. We justify this hypothesis through performing: (1) detailed numerical simulations, (2) electrical characterization experiments of functional SS-OPV devices using multiple polymers (P3HT, MEH-PPV, PQT-12, etc.) as active layer materials, and (3) detailed impedance spectroscopy measurements. Furthermore, we show that the collection-limited photocurrent theory consistently interprets typical characteristics of regular SS-OPV devices. These insights should encourage the design and OPV-implementation of high purity, high mobility polymers, and other soft materials that have shown promise in organic field-effect transistor (OFET) applications, but have not performed well in bulk heterojunction OPV devices, wherein they adopt less-than-ideal nanostructures when blended with electron-accepting materials.